There is good news in the air. 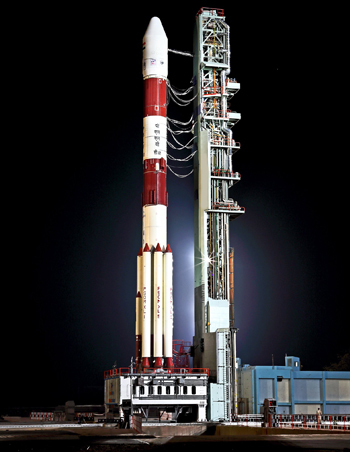 NavIC ('Navigation with Indian Constellation' whose English meaning is 'sailor' or 'navigator') or the Indian Regional Navigation Satellite System (IRNSS), our indigenous and fully autonomous regional satellite navigation system, is in the final stages of launch. It could soon be offered as an Indian counter to foreign systems currently being used by companies and other users. 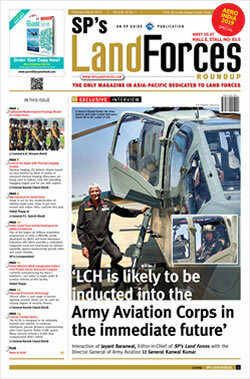 The Request for Proposal (RFP) has been issued to start its implementation. India has been dependent on the US Global Positioning System (GPS) consisting of 31 satellites that provide geolocation and time information to GPS receivers around the world. Created and maintained by the US government, it is freely accessible to anyone with GPS receiver. But GPS has two strategic implications: first, the US can switch it off when required, as India experienced during the Kargil Conflict to the disadvantage to Indian Military, and second; US can also deliberately feed wrong geolocations when it so wants. The latter can be fed to most GPS users. Only the US Special Forces are equipped with special GPS receivers that cannot be fed wrong data. Other countries that have developed own indigenous system are Russia (GLONASS - Global Navigation Satellite System), European Union (Galileo Positioning System), Japan (Quasi-Zenith Satellite System - QZSS) and China (Beidou Navigation Satellite System - BDS). The Department of Space (DOS) in their 12th Five Year Plan (2012–17) aimed to increase the number of satellites in the constellation from 7 to 11 for extended. Also, development of space qualified atomic clocks was initiated, along with study and development initiative for All Optical Atomic Clock (ultra stable for IRNSS and Deep Space Communication). 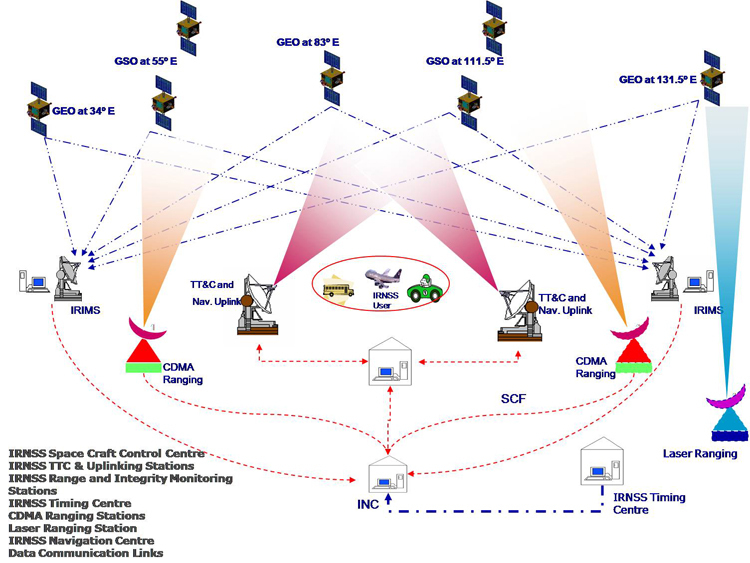 Study and analysis for the Global Indian Navigation System (GINS) was also initiated as part of the technology and policy initiatives in the 12th Five Year Plan (2012–17). The system is supposed to have a constellation of 24 satellites, positioned 24,000 km (14,913 mi) above Earth. By 2013, the statutory filing for frequency spectrum of GINS satellite orbits in international space, had been completed. ISRO took the lead for developing NavIC, or the Indian Regional Navigation Satellite System (IRNSS), which will work through a constellation of seven satellites. The satellite system was announced in 2007 and was originally scheduled to be fully operational by 2012. However there were delays and because of delays, its launch was postponed to 2018. The name NavIC was given by PM Narendra Modi on successful launch of IRNSS-1G, the seventh and last satellite of NavIC; IRNSS-1A, 1B, 1C, ID,1E, 1F and 1G were successfully launched on July 02, 2013, Apr 04, 2014, Oct 16, 2014, Mar 28, 2015, Jan 20, 2016, Mar 10, 2016 and Apr 28, 2016 respectively and all are functioning satisfactorily from their designated orbital positions. The Space Segment of these seven satellites consists of three satellites in GEO stationary orbit (GEO) and four satellites in Geo Synchronous Orbit (GSO) orbit with inclination of 29° to the equatorial plane. All the satellites are visible at all times in the Indian region. IRNSS-1I is the eighth satellite to join the NavIC navigation satellite constellation which was launched by PSLV-C41 on April 12, 2018. However, launch of IRNSS-1H / PSLV-C39 Mission on August 31, 2017 was not successful. Applications of the IRNSS include: terrestrial, aerial and marine navigation; disaster management; vehicle tracking and fleet management; integration with mobile phones; precise timing; mapping and geodetic data capture; terrestrial navigation aid for hikers and travelers, and visual and voice navigation for drivers. Significantly, in comparison to the American GPS which has a position accuracy of 20-30m, NavIC will provide a position accuracy of 5m, making it technically better than the GPS. Also, GPS is dependent only on 'L' band and when low frequency signal travels through atmosphere, its velocity changes due to atmospheric disturbances, causing error. Therefore, US banks on atmospheric model to assess frequency error and it has to update this model from time to time to assess the exact error. But NavIC measures the difference in delay of dual frequency (S and L bands) and can assess the actual delay. Therefore NavIC is not dependent on any model to find the frequency error and is more accurate than GPS, However, in the present configuration, NavIC only covers India and its surroundings within 1,500 km from the border, which is its primary service area. An Extended Service Area lies between primary service area and area enclosed by the rectangle from Latitude 30 deg South to 50 deg North, Longitude 30 deg East to 130 deg East. Developed reportedly at a cost of 1400 cr, NavIC will provide two types of services: one, Standard Positioning Service (SPS) for all users, and; two, Restricted Service (RS) using encryption, only for authorized users. It should be a matter of only few months now that Indians can enjoy directions of NavIC on their smartphones, car navigation systems etc while security forces have access to more accurate and unhindered navigation, timing, mapping and geodetic data capture services available to them.